Creative Diagnostics is committed to providing the best antibodies available. We are currently retesting the entire portfolio of CD antibodies to verify that they are specific to the indicated targets. Antibodies that have passed the KO/KD test will be labeled with the KO/KD validated icon. 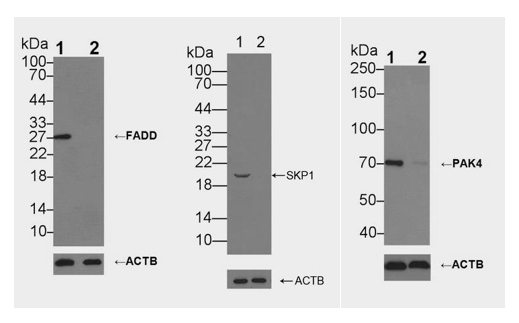 Western blot using knockout (KO) cell lysate has become a new practice for antibody validation. In KO validation, a knockout cell line was paired with the parental cell line in western blot analysis. A truly specific antibody recognizes the target protein of right molecular weight in the WT cell lysate, but not in the KO cell lysate. Share your KO/KD data with us! If you want to share your knockout/knockdown validation data using CD antibodies with us, please feel free to mail to send us an email or contact us for further information. With your posted results, you will qualify for the Products Review Program.